Fractional laser skin resurfacing with Palomar maximizes client aesthetic outcomes while minimizing procedure risk and reducing downtime. It’s the smart approach to skin resurfacing that uses microbeams to create areas of treated tissue surrounded by untreated tissue, which provides faster healing and reduced side effects. The technology is the perfect choice for the treatment of wrinkles, acne and surgical scars, melasma, striae, unwanted textural irregularities, crow’s feet, blotchy skin and more, on virtually any trouble spot on the body – face, neck, chest, arms, legs. Fractional Laser Skin Resurfacing is an almost miraculous skin therapy; this laser therapy is arguably far more effective than any commercially produced cream or lotion on the market today, and is far superior to other medical procedures such as dermabrasion or chemical peeling. 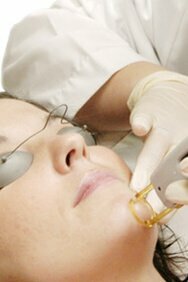 Fractional Laser therapy replaces old skin with new skin in just a matter of days without the significant “down-time” and adverse side effects associated with other resurfacing techniques. Because areas of skin are treated in sections, 4 to 6 sessions are generally necessary. Call our professionally trained and courteous staff to discuss how this Laser Skin Renewal technique may make you enjoy looking in your mirror! Youthful-looking skin may be only steps away with the Palomar StarLux® Laser and Pulsed Light System. The StarLux System uses the Lux1540™ Fractional Non-Ablative Laser Hand-piece to deliver light as an array of micro-beams, which create columns of coagulated tissue within the skin. Creation of the columns starts a natural healing process that forms new, healthy tissue. This results in more youthful-looking skin. StarLux Fractional Non-Ablative Skin Resurfacing is a unique method which delivers excellent results and virtually no downtime. While leaving the stratum corneum in place, Lux1540 micro-beams penetrate deeper into the epidermis and dermis than competing devices for effective, long-term results. The fractional, non-ablative approach stimulates quick healing, with no lasting redness. The Palomar Lux 1540 Fractional Laser gives a fresher, more youthful skin tone and texture. The fractional laser uses narrowly focused beams to initiate a natural healing process resulting in new, healthy tissue. 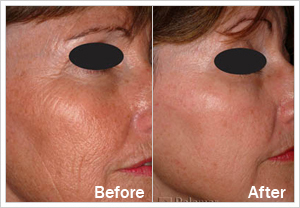 Fractional skin resurfacing with Palomar uses laser energy micro-beams to create areas of affected tissue that extend through the epidermis into the dermis. Non-ablative procedures are minimal to no downtime procedures. The body’s natural healing process creates new, healthy tissue to replace the areas of affected tissue, resulting in healthier, younger-looking skin.